Advertising Week EuropeSean Rad, speaking at Advertising Week Europe, in London, in April 2016. A group of 10 current and former Tinder employees are suing the dating app’s parent company, IAC, for $US2 billion. They allege IAC purposely undervalued the startup to devalue early employee options. Tinder was founded as part of an IAC-owned incubator, and conflicts over its ownership structure and its founders’ equity stakes go back to the founding of the company, according to the complaint. 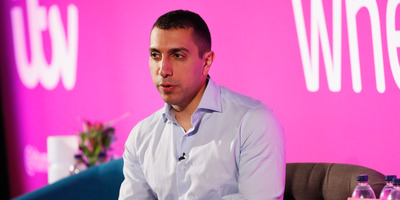 A group of early Tinder employees, including cofounders Sean Rad, Justin Mateen, and Jonathan Badeen, announced on Tuesday that they had filed a lawsuit against InterActiveCorp and Match Group, the owners of Tinder. They’re alleging that IAC used a lowball valuation based on false information to reduce the value of stock options that early employees and founders held. The plaintiffs are seeking at least $US2 billion. The Tinder team received written contracts in 2014 outlining stock options as well as four dates they could exercise them, according to Tuesday’s complaint. But they allege that ahead of the first exercise date, in May 2017, IAC valued Tinder at $US3 billion and merged it with Match, which “stripped away” the team’s options in the fast-growing dating app, leaving them with less valuable Match options. They also say that IAC put its own financial executive inside Tinder, Greg Blatt, who concluded that Tinder was worth less than the Tinder team thought it was. The valuation is important because although Match is a publicly traded company, Tinder was not, which meant that the valuation process directly affected how much the founders’ options were worth. “The reason for these management changes was clear: to allow defendants to control the valuation of Tinder and deprive Tinder optionholders of their right to participate in the company’s future success,” according to the complaint. The suit also alleges that Blatt, the former IAC chairman and CEO, groped Rosette Pambakian, Tinder’s VP of marketing and communications, at a Tinder holiday party in 2016, shortly after Blatt took over as interim CEO. Tinder operates independently on a day-to-day basis from IAC and Match, according to the complaint, and it’s based in Los Angeles. Tinder was founded in an incubator, Hatch Labs, that was majority-owned by IAC. Conflicts over its ownership structure and its founders’ equity stakes go back to the founding of the company, according to the complaint. The group of early Tinder employees are represented by Orin Snyder of the firm Gibson Dunn, who famously argued Apple’s case in an e-book price-fixing lawsuit. “The allegations in the complaint are meritless, and IAC and Match Group intend to vigorously defend against them.